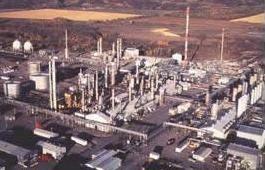 A typical large natural gas processing plant. Natural gas processing plants are used to purify the raw natural gas extracted from underground gas fields and brought up to the surface by gas wells. The processed natural gas, used as fuel by residential, commercial and industrial consumers, is almost pure methane and is very much different from the raw natural gas. Heavier gaseous hydrocarbons: ethane (C2H6), propane (C3H8), normal butane (n-C4H10), isobutane (i-C4H10), pentanes and even higher molecular weight hydrocarbons. When processed and purified into finished by-products, all of these are collectively referred to as NGL (Natural Gas Liquids). Be within a specific range of heating value (caloric value). For example, in the United States, it should be about 1,035 ± 5% Btu per standard cubic foot of gas at an absolute pressure of 1 atmosphere and 60 °F (41 ± 5% MJ per normal cubic metre of gas at 1 atmosphere of absolute pressure and 0 °C). Be dehydrated of water vapor sufficiently to prevent the formation of methane hydrates within the gas processing plant or subsequently within the sales gas transmission pipeline. Maintain mercury at less than detectable limits (approximately 0.001 ppb by volume) primarily to avoid damaging equipment in the gas processing plant or the pipeline transmission system from mercury amalgamation and embrittlement of aluminium and other metals. Raw natural gas comes primarily from any one of three types of wells: crude oil wells, gas wells, and condensate wells. Natural gas that comes from crude oil wells is typically termed associated gas. This gas can exist separate from the crude oil in the underground formation, or dissolved in the crude oil. Natural gas from gas wells and from condensate wells, in which there is little or no crude oil, is termed non-associated gas. Gas wells typically produce only raw natural gas, while condensate wells produce raw natural gas along with a low-boiling point mixture of liquid hydrocarbons called natural gas condensate (sometimes also called natural gasoline, casinghead gasoline or simply condensate). Raw natural gas can also come from methane deposits in the pores of coal seams. Such gas is referred to as coalbed gas and it is also called sweet gas because it is relatively free of hydrogen sulfide. The acid gases removed by amine treating are then routed into a sulfur recovery unit which converts the hydrogen sulfide in the acid gas into elemental sulfur. There are a number of processes available for that conversion, but the Claus process is by far the one usually selected. The residual gas from the Claus process is commonly called tail gas and that gas is then processed in a tail gas treating unit (TGTU) to recover and recycle residual sulfur-containing compounds back into the Claus unit. 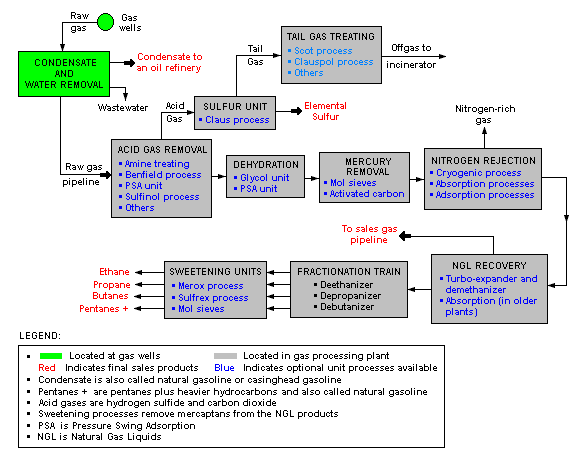 Again, as shown in the flow diagram, there are a number of processes available for treating the Claus unit tail gas. The final residual gas from the TGTU is incinerated. Thus, the carbon dioxide in the raw natural gas ends up in the incinerator flue gas stack. The next step in the gas processing plant is to remove water vapor from the gas using either the regenerable absorption (chemistry) in liquid triethylene glycol (TEG), commonly referred to as glycol dehydration, or a Pressure Swing Adsorption (PSA) unit which is regenerable adsorption using a solid adsorbent. Other newer processes requiring a higher pressure drop like using membranes or dehydration at supersonic velocity using, for example, the Twister Supersonic Separator may also be considered. Mercury is then removed by using adsorption processes (as shown in the flow diagram) such as activated carbon or regenerable molecular sieves. The next step is to recover the natural gas liquids (NGL) for which most large, modern gas processing plants use another cryogenic low temperature distillation process involving expansion of the gas through a turbo-expander followed by distillation in a demethanizing fractionating column. Some gas processing plants use a lean oil absorption process rather than the cryogenic turbo-expander process. Schematic flow diagram of a typical large natural gas processing plant . ↑ Desulfurization of and Mercury Removal From Natural Gas by Bourke, M.J. and Mazzoni, A.F., Laurance Reid Gas Conditioning Conference, Norman, Oklahoma, March 1989. This page was last modified 12:07, 12 September 2013.